A spell-binding modern retelling of a classic children's tale by master storyteller Michael Morpurgo, with glorious illustrations by Emma Chichester Clark. In the town of Hamelin, the rich and greedy live like kings and queens while the poor and sick scavenge rubbish tips for scraps. 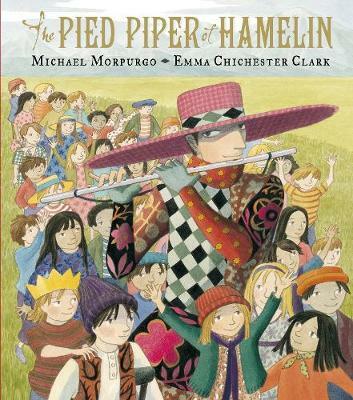 A lame orphan boy tells the classic tale of how a plague of rats take over the town and how a fantastic piper offers to rid Hamelin of its rats for a single gold coin, then lures away the town's children when the greedy mayor breaks his word. Masterfully weaving contemporary social and environmental themes into a gripping tale, and celebrating it with breath-taking illustrations, former British Children's Laureate Michael Morpurgo and illustrator Emma Chichester Clark team up to create a compelling new take on this timeless story. Much-loved and prolific children's author of animal stories.